Pocket Installation – A pocket install is characterized by leaving the frame of the old window in place. Sashes, parting stops, jamb liners, and storm windows are removed, leaving only the old window frame. The new window is custom sized to fit inside the old frame. A narrower 3 ¼” frame width is necessary for windows being used for this installation method. 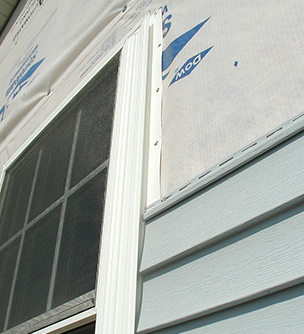 Advantages: Pocket installs are quick, easy and generally a less expensive option for replacing a window. This method allows for a window to be installed without removing or upsetting the existing interior trim. Disadvantages: Leaving the existing window frame in place does not allow for inspection and treatment of the rough opening for water damage, rotted wood, lack of insulation, insect infestation, or mold. A pocket install generally leaves significantly less glass than the original window. This can affect the available light, viewing area, and general appearance. Leaving old worn trim can be a “mismatch” to the appearance of new windows. Full Frame Installation – A full frame install is characterized by removal of the entire existing window. This type of removal should result in the exposure of the original studded opening, or rough opening. Advantages: Complete removal of the old window allows for the inspection and treatment of the rough opening for water damage, rotted wood, insect infestation and mold. A new full frame installation can utilize current water management and insulation materials and practices. Interior light levels, viewing areas, and general appearances are maintained as a result of glass sizes being similar to the original windows. Interior window trim is usually replaced with a full frame install. New interior window trim is attractive and offers choice for both color and style change. Disadvantages: Full frame installs are more extensive and generally a more expensive option for replacing a window. Summary – Each install method has its place. An older historic home with elaborately detailed interior trim that must be saved may require a pocket install in order to perform the install without upsetting the interior trim. On the other hand, a home that is showing water damage from poorly installed or leaky windows may require a full frame install to address any water damage or rot before installing new windows with a proper water management system. For most homes the decision is not so obvious. It is up to the homeowner, with the help of their window contractor, to weigh the benefits of each install method and decide which is best for them.